Also available: Chime enhanced, VRML, and Jmol versions. It was December, 1965. Jim Schlatter, a chemist at G.D. Searle, was working on a project to discover new treatments for gastric ulcers. To test new anti-ulcer drugs, the biologists used a tetrapeptide (four amino acids) normally produced in the stomach; Schlatter was synthesizing this tetrapeptide in the lab, and one of the steps in the process was to make a dipeptide intermediate, aspartyl-phenylalanine methyl ester. In the course of his work, Schlatter accidentally got a small amount of the compound on his hands without noticing it. Later that morning, he licked his finger as he reached for a piece of paper, and noticed a sweet taste. His curiosity drove him to ask "Where did that sweet taste come from?" His first thought was of the doughnut he had eaten during his coffee break, but he realized that he had been to the bathroom and had washed his hands since then. It could only be the aspartyl-phenylalanine methyl ester he had worked with. He knew that aspartic acid and phenylalanine, which make up this product, are natural amino acids present in all proteins, so he felt it would be safe to taste the material. It was sweet! He and his lab partner, Harman Lowrie, both tasted the material in 10 ml of black coffee, noting the sweet taste as well as the absence of any bitter aftertaste, and recorded the results in Schlatter's laboratory notebook. His boss, Dr. Bob Mazur, convinced the company of the potential value of this discovery. Twenty years later, Schlatter's curiosity had resulted in a billion dollar per year sweetener. If you are interested in sweetener discovery stories, see The History of High Potency Sweeteners: Tales of Discovery. Aspartame has a sweet taste with minimal bitterness for most tasters. Its onset of sweetness may be slightly slower than sucrose, and the sweetness may linger. The sweetness potency relative to sucrose is about 180, but depends upon the concentration of sucrose which is being matched. The concentration vs. response relationship in water (results in food systems will vary) is shown below. This graph is based on data from DuBois, Walters, Schiffman, Warwick, Booth, Pecore, Gibes, Carr & Brands in "Sweeteners: Discovery, Molecular Design, and Chemoreception," D.E. Walters et al., Eds., American Chemical Society, 1991. The equation allows you to calculate sweetness response (R) for any concentration (C). The units of R are percent sucrose equivalent; the units of C are parts per million (ppm). Then you can calculate the concentration required (C) to give a desired response (R). 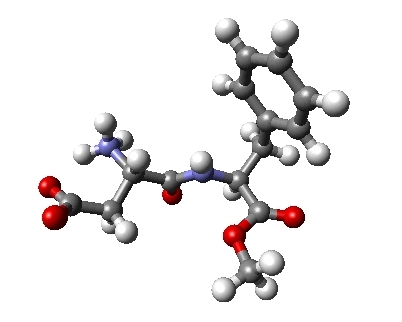 Aspartame is a dipeptide methyl ester: L-aspartyl-L-phenylalanine methyl ester. At neutral pH in water, both functional groups are ionized. Stability is maximal at pH 4.3. Aspartame is metabolized in the body to its components: aspartic acid, phenylalanine, and methanol. Like other amino acids, it provides 4 calories per gram. Since it is about 180 times as sweet as sugar, the amount of aspartame needed to achieve a given level of sweetness is less than 1% of the amount of sugar required. Thus 99.4% of the calories can be replaced. Aspartic acid (also called "aspartate") is a naturally occuring amino acid which is a component of all proteins. It is classified as a "non-essential" amino acid, meaning that humans do not need to get it from their diets since they can make it from other things in the diet. Aspartic acid is important in the synthesis of new DNA, in urea synthesis, and as a neurotransmitter in the brain. As such, its levels in the body are carefully regulated. If the body needs more aspartic acid, it makes more, using oxaloacetate from the tricarboxylic acid cycle (Krebs cycle) of energy metabolism. If the body has a surplus of aspartic acid, it converts the excess to fumarate, which enters the tricarboxylic acid cycle and provides energy. Phenylalanine is one of the "essential" amino acids, meaning that humans must get it from their diet. It is a precursor for the synthesis of tyrosine and several neurotransmitters. Excess phenylalanine is broken down to fumarate and acetoacetate, both of which are part of normal energy metabolism. People who lack the enzyme to convert phenylalanine to tyrosine are not able to metabolize phenylalanine normally. This condition is called phenylketonuria because, in these people, excess phenylalanine is instead converted to phenylketones which appear in the urine. If it is not detected and treated, this condition can lead to mental retardation. This was the first genetic disease for which a routine screening test became available. Persons having this genetic defect must monitor their intake of phenylalanine. For this reason, products containing aspartame carry an information label for phenylketonurics. Methanol is commonly encountered in the diet. The table below shows the amount of methanol you would get from a can of diet soft drink, along with amounts found in the same volume of several fruit juices. Methanol is well known to be poisonous in large quantity. "Large quantity" means tens or hundreds of grams. Your liver can deal with reasonable quantities of methanol, metabolizing it so that it can be excreted. If you start drinking enough methanol to get inebriated, you overwhelm your liver's metabolic machinery, and serious problems result. Is aspartame safe? In my opinion, it is extremely safe--I know exactly how it is handled in the body. I have no reservations about letting my children or my parents use it. There is a web site for Equal, a sweetener based on aspartame. Holland Sweetener Company (HSC), a 50/50 joint venture of DSM and Tosoh, produces and markets aspartame. HSC is the world's second-largest aspartame producer. The American Dietetic Association has objective and well-documented information about sweeteners on its website. I have information on a number of other high potency sweeteners on my web pages.